This dip is truly delicious and kind of fun to make. It is very similar to a baba ganoush, but only without the tahini. Variations of baba ganoush are served across the Middle East, but there are also similar burnt eggplant dishes in Indian and Romanian cuisine. In this version, Ottolenghi adds pomegranate molasses. I take it one step further and sprinkle with pomegranate seeds for a refreshing pop of flavors. See my post on the definitive best way to seed pomegranates. The key to this recipe is to flame the eggplant until the skins are shriveled, burnt and begin to burst. You can do this over an outdoor grill or indoors on a gas oven. It can get a little messy, so I recommend wrapping your burner with aluminum foil before you begin. Use tongs to support the eggplant. I actually set the eggplant directly on the burner and turn it frequently. Another secret to this recipe is to really pulverize your garlic. Smash the cloves with the blade of your chef's knife or a pot to remove the peels. Then chop the peeled garlic finely. Add a bit of salt and mash the salt into the garlic with the side of your knife blade. Then chop it some more. I like to add two garlic cloves per eggplant. Ottolenghi adds only one, but David Lebovitz uses a bold three cloves in his baba ganoush. Remember we are talking raw garlic, and a little goes a long way. It is always best to eat raw garlic with friends and never on a first date or a job interview! You can blend the eggplant in a blender or food processor for a smooth sauce, or chop coarsely for a chunkier sauce. Ottolenghi's delicious variation on baba ghanoush. 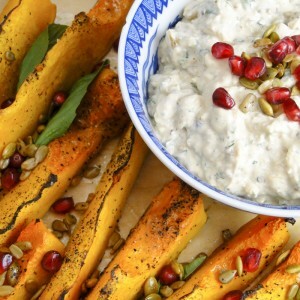 Burnt eggplant, greek yogurt, lemon juice and a splash of pomegranate molasses is fabulous with roasted butternut squash, pita bread and crudites. Heat oven to 425 degrees. Use a fork to poke a few holes in the eggplant. Pinch the eggplant with a pair of tongs and hold the eggplant directly over the flame of a gas burner or outdoor grill. Turn the eggplant periodically to burn all sides of the eggplant, until the skin has burst and the eggplant is shriveled and burnt, a total of about 15 minutes. When the eggplant is cool enough to touch slice in half from stem to stern and place on a lightly oiled baking sheet. Bake in the oven until the inside of the eggplant is soft and tender, about 10 minutes. Allow the eggplant to cool a few minutes until it can be comfortably handled. Scoop out the inside of the eggplant, leaving the burnt skin and place in a colander. Allow to drain for 10 minutes. For a smooth sauce pulse in a food processor. For a chunkier sauce chop the eggplant by hand. 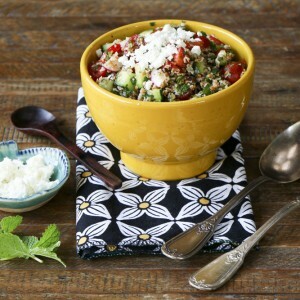 In a bowl, mix the chopped eggplant, yogurt, olive oil, pomegranate molasses, lemon juice, parsley, garlic, salt and pepper. 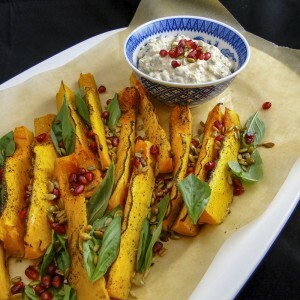 Garnish with pomegranate seeds or a drizzle of good olive oil. Can be made a day or two in advance and stored in the refrigerator. Agh I could eat this stuff with a spoon. I love roasted eggplant! Any tips on the size/type of eggplant? I have bought the big globe eggplants but sometimes they have a lot of seeds and are bitter. I’m so glad you enjoyed the recipe. With regards to eggplant advice – Eggplant gets bitter as it ages. So cook your eggplant soon after you buy it. If you press on the skin of an eggplant and it does not spring back, the eggplant is old. Also larger eggplants are tougher, so choose smaller eggplants. Japanese eggplant is sweeter than globe eggplant. I am not sure Japanese eggplant would hold up to burning as they are so thin. There might not be much left after you burn them, but it might be worth an experiment. I was initially intimidated by this recipe, but once I dove in, found that its actually pretty easy and amazingly delicious. I roasted the eggplant right on top of my gas stove. I sat each eggplant on top of a burner and rotated them with tongs periodically. After roasting them in the oven, I scooped out the middle and added it to all the ingredients. We didn’t have pomegranate molasses, so instead we used raspberries and increased the amount of lemon juice. We served this with pita bread and roasted tomatoes (recipe also from Something New For Dinner). The dip was a hit and everyone asked how we made it 🙂 Would certainly make this again! I love the raspberry and lemon juice inspiration! So glad it was a hit with your guests! Ottolenghi’s recipes rarely fail.